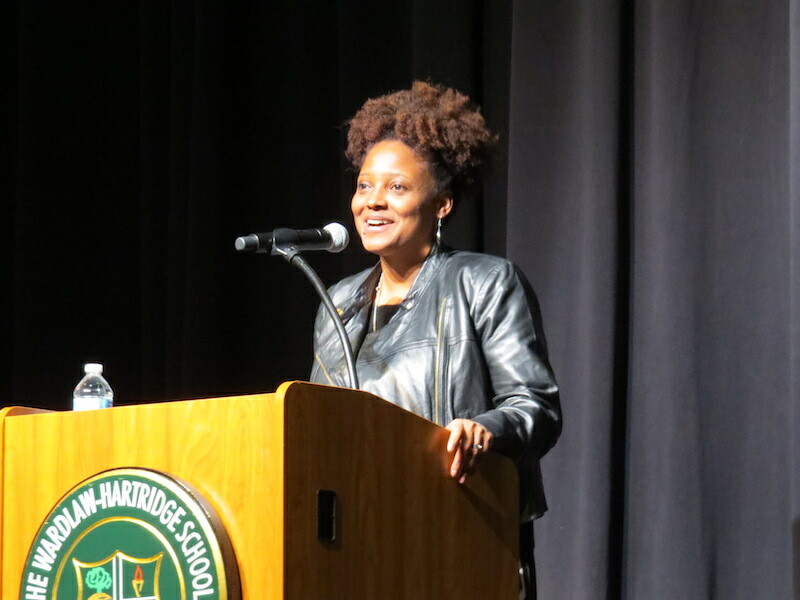 Tracy K. Smith, the current U.S. Poet Laureate and Director of the Creative Writing Department at Princeton University, spent a few exciting hours on the W+H campus reading to and meeting with students on April 4. At the Berry Performing Arts Center, Ms. Smith read poems from her Pulitzer Prize winner, Life on Mars, as well as new poems from her collection published this week, Wade in the Water. Poems such as "Sci-Fi," "The Universe as Primal Scream," and "Wade in the Water" challenged the audience to think about being human in an incomprehensible universe, full of paradox. She also read poems from her current project involving the American South and the inescapable visual vestiges of slavery and institutional racism. To help provide insight into a poem's imagery, sound and form, Ms. Smith shared her inspiration behind particular poems. Students asked Ms. Smith questions at the end of her reading. A small group discussion with Upper School students followed in the Center for Global Learning where students engaged in a Q and A with Ms. Smith, read original work inspired by Life on Mars, and had their books signed. AP Language and Composition juniors read Tracy K. Smith's Life on Mars last trimester and were familiar with her work. It was a joy-filled day of poetry. "The students here are so poised and deeply thoughtful," Ms. Smith said. "Their questions were unique and I was moved by the writing they have done in response to the poems."